Silver and grey lehengas are trending big time this wedding season! There is something quite elegant about the silver shimmeries. And when its your wedding day and you want to look radiant and glamorous at the same time, silver is the choice to go for. Silver and grey lehengas are rich, classy, timeless and have an understated glamour of its own. This net based silver lehenga with silver beads studded on it is the perfect option to go for your pre-wedding sangeet. This beautiful brocade greyish-silver lehenga with a boat neck blouse and net dupatta is perfectly carried by our stylish Kale chashme wali bride. This absolutely stunning beauty made her wedding collection choice from the Sabyasachi house again. The hint of pastel pink along with silver embroidery is melting our hearts. This famous Vogue editor, Shruti Thacker opted for silver lehenga yet again for her pre wedding function. Her lehenga made a style statement coming from the Manish Malhotra collection. Remember Sagarika Ghatge on her reception night? She opted for a beautiful grey coloured organza lehenga and ruled our hearts with it. Jhanvi Kapoor, the beautiful daughter of the late diva Shri Devi Kapoor, stepped in the lit wedding of Sonam Kapoor in a pastel pink and silver lehenga embedded with feathers on it, looking like a goddess! When it comes to glamour, Alia Bhatt never slips from our mind. She opted for this glittery grey lehenga from the house of Amit Patel, for her best friend, Kripa Mehta’s wedding and she definitely turned a lot of heads around. With a little mix n match of colours this bride created the perfect combination for her grand day. We absolutely adore this pretty combination of Red with Silver, making her a trendy ‘Bride in red’. Sabyasachi is the master of perfection when it comes to designing bridal outfits. This beautiful Sabyasachi bride went for the perfect blend of coral pink with silver for her most special day. The dupatta compliments the lehenga beautifully with hanging glittery tassels on the sides. Another exceptionally beautiful lehenga from the Sabyasachi collection. This beautiful bride chose this silver embedded lehenga for her sangeet night. Loved the hint of blue in it. Richa and Abhilash, who recently got hitched in a beautiful ceremony in Jodhpur, showcased the best collection of bridal wear. The pretty bride opted for a silver lehenga for her sangeet and her wedding day and dazzled the nights. When it comes to talking about the trendiest weddings and its brides, Samantha Prabhu is bound to pop in your head. 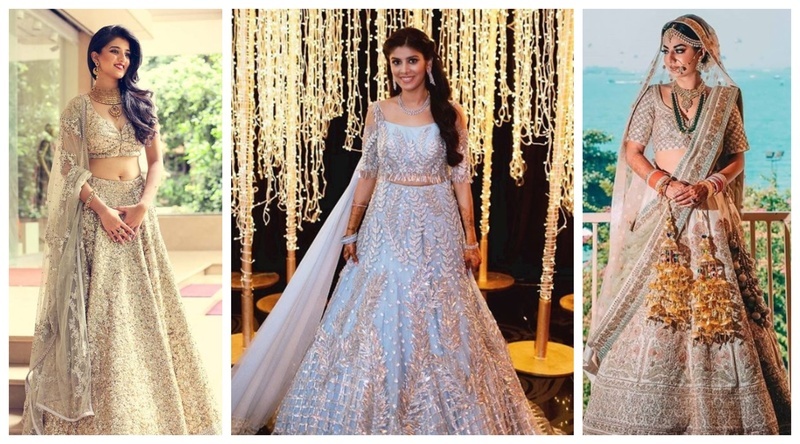 This actress created a style statement with her utterly beautiful silver shimmery lehenga for her sangeet ceremony. The elegance and grace of Sabyasachi never fades and the reason why so many brides rely on him for their wedding day. This time showcasing a different but extremely elegant silver and golden colour combination lehenga with full shimmery blouse. This proper patola punjabi bride went yet again for a subtle combination of pastel pink with silver. She paired elegant green and silver coloured jewellery and created a style statement on her big night. This royal nawabi wedding showcasing a beautiful begum again witnessed the perfect combination of pastel pink and silver. She opted for this aw-gazing heavy embroidery Sharara for her most special day. So, if you are a 2018-19 bride and are confused about your lehenga colour, grey & silver should definitely be there in your shortlist!